Cryopreservation is a fertility therapy that involves the extraction, freezing, and storage of a woman’s oocytes for future use. The oocytes can be thawed when the patient is ready to use them, at which point they can be fertilized through in-vitro fertilization and transferred back into the uterus as embryos or blastocysts. From this point on, the pregnancy can proceed as normal. Cryopreservation allows for several advantages that would otherwise be unavailable to patients seeking to get pregnant by natural, usual methods. It is important to increase the IVF success rates in the Philippines, same as other parts of the world. Cryopreservation of oocytes is a favorable choice for women currently undergoing assistive reproductive therapy, but do not wish to freeze embryos, due to personal reasons such as conflict with ethics or religious beliefs. By freezing oocytes instead of embryos, the issue of disposal of unused, living embryos, or blastocysts further along in development is entirely avoided. It also allows women who have been diagnosed with breast cancer and who have not yet started therapy to preserve their eggs for when they have completed chemotherapy or radiotherapy. These treatment modalities have been well documented as potentially harmful to ovaries. 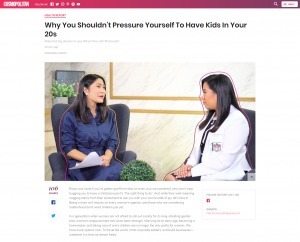 Also, women who simply choose to postpone motherhood until they have found the right partner, have established their careers, or have attained a level of personal maturity or financial security can benefit from cryopreservation their oocytes. For men, cryopreservation of their sperm or testicular tissue is similarly useful in cases where they face cancer treatment that is potentially toxic to reproductive tissues. They can then attempt assistive reproductive therapies in the future, after successfully completing their treatment regimen. Preserving testicular tissue is a solution for treating azoospermia, allowing men to maximize their full reproductive potential. Cryopreservation can also be applied to later stages of development, typically in the embryonic stage. Both embryos and blastocysts (i.e. an embryo at 5-6 days after fertilization) can be stored in this manner. Sperm can also be harvested from the male partner, through collection from his testicular tissue, in cases where it is indicated. Cryopreservation in the Philippines is more common these days, and is performed in concert with in-vitro fertilization for patients struggling with infertility. If the transfer of the embryo into a woman’s uterus fails, other embryos, which had been previously preserved, can be transferred instead. By having more embryos available, the chances of a successful pregnancy are increased. Embryo cryopreservation is what makes this possible. Embryos that have not been used can be donated to another woman or couple who have unsuccessfully tried getting pregnant, and are diagnosed with infertility. They too can undergo assistive reproductive therapy using donated embryos and start families of their own.